The automatic transaxle has 6 forward speeds and one reverse speed. 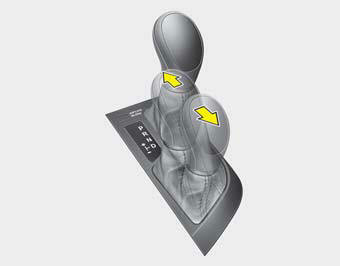 The individual speeds are selected automatically, depending on the position of the shift lever. 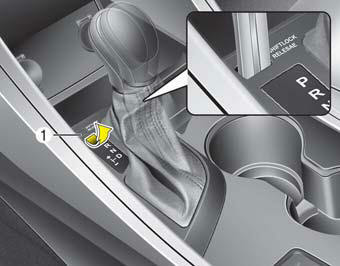 To move the shift lever from the P (Park) position, the brake pedal must be depressed and the lock release button must be pressed. • Always check the surrounding areas near your vehicle for people, especially children, before shifting a car into D (Drive) or R (Reverse). • Before leaving the driver’s seat, always make sure the shift lever is in the P (Park) position; then set the parking brake fully and shut the engine off. Unexpected and sudden vehicle movement can occur if these precautions are not followed in the order identified. • To avoid damage to your transaxle, do not accelerate the engine in R (Reverse) or any forward gear position with the brakes on. • When stopped on an incline, do not hold the vehicle stationary with engine power. Use the service brake or the parking brake. • Do not shift from N (Neutral) or P (Park) into D (Drive), or R (Reverse) when the engine is above idle speed. The indicator in the instrument cluster displays the shift lever position when the ignition switch is in the ON position. Always come to a complete stop before shifting into P (Park). This position locks the transaxle and prevents the drive wheels from rotating. • Shifting into P (Park) while the vehicle is in motion will cause the drive wheels to lock which will cause you to lose control of the vehicle. • Do not use the P (Park) position in place of the parking brake. Always make sure the shift lever is latched in the P (Park) position and set the parking brake fully. • Never leave a child unattended in a vehicle. Always come to a complete stop before shifting into or out of R (Reverse); you may damage the transaxle if you shift into R (Reverse) while the vehicle is in motion, except as explained in “Rocking the vehicle” in this section. This is the normal forward driving position. The transaxle will automatically shift through a 6-gear sequence, providing the best fuel economy and power. For extra power when passing another vehicle or climbing grades, depress the accelerator fully, at which time the transaxle will automatically downshift to the next lower gear. In sports mode, moving the shift lever backwards and forwards will allow you to make gearshifts rapidly. • In sports mode, the driver must execute upshifts in accordance with road conditions, taking care to keep the engine speed below the red zone. • In sports mode, only the 6 forward gears can be selected. To reverse or park the vehicle, move the shift lever to the R (Reverse) or P (Park) position as required..
• In sports mode, downshifts are made automatically when the vehicle slows down. When the vehicle stops, 1st gear is automatically selected..
• In sports mode, when the engine rpm approaches the red zone, the transaxle will upshift automatically..
• To maintain the required levels of vehicle performance and safety, the system may not execute certain gearshifts when the shift lever is operated..
• When driving on a slippery road, push the shift lever forward into the +(up) position. This causes the transaxle to shift into the 2nd gear which is better for smooth driving on a slippery road. Push the shift lever to the -(down) side to shift back to the 1st gear. 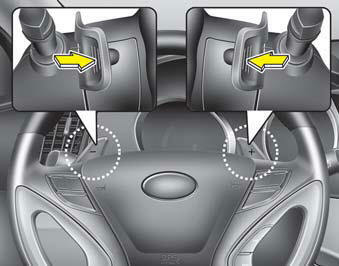 With the shift lever in the D position The paddle shifter can operate when the vehicle speed is more than 10km/h. To shift the transaxle from P (Park) or N (Neutral) into R (Reverse): 1. Depress and hold the brake pedal. 1. Carefully remove the cap (1) covering the shift-lock access hole. 2. Insert a key (or screwdriver) into the access hole and press down on the key (or screwdriver). • Never move the gear shift lever from P (Park) or N (Neutral) to any other position with the accelerator pedal depressed. • Never move the gear shift lever into P (Park) when the vehicle is in motion. • Be sure the car is completely stopped before you attempt to shift into R (Reverse) or D (Drive). • Never take the car out of gear and coast down a hill. This may be extremely hazardous. Always leave the car in gear when moving. • Do not "ride" the brakes. This can cause them to overheat and malfunction. Instead, when you are driving down a long hill, slow down and shift to a lower gear. When you do this, engine braking will help slow the car. • Slow down before shifting to a lower gear. Otherwise, the lower gear may not be engaged. • Always use the parking brake. Do not depend on placing the transaxle in P (Park) to keep the car from moving. • Exercise extreme caution when driving on a slippery surface. Be especially careful when braking, accelerating or shifting gears. On a slippery surface, an abrupt change in vehicle speed can cause the drive wheels to lose traction and the vehicle to go out of control. • Optimum vehicle performance and economy is obtained by smoothly depressing and releasing the accelerator pedal. To move up a steep grade from a standing start, depress the brake pedal, shift the shift lever to D (Drive). Depress the accelerator gradually while releasing the service brakes.